Back Chat: Boston: The First Adventure. Happily settled in our amazing billet in Seekonk, Eugene and I were constantly delighted by its close proximity to some of the great cities in that north eastern corner of the United States. Robin and James remained unfazed by distances or the prospect of driving those distances. So a distance of 80 kilometres (50 miles) from Providence to Boston was dismissed as a mere bagatelle. 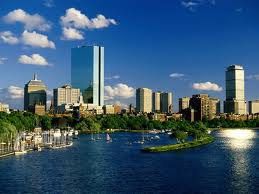 During our time in New England, we would visit Boston three times, each time an adventure. Our first adventure was to the Museum of Fine Arts in Boston. Robin whisked us off to Boston, driving through lovely countryside that reminded us of the lush greenery in the Western Cape. The buildings of Boston are beautiful and dignified and the city seems mellow and comfortable with itself. There is a very different vibe in Boston from the extraordinary madness of New York City. But we love both cities. 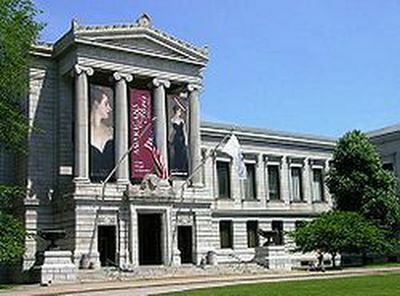 The Museum of Fine Arts at 465 Huntington Avenue is one of the largest museums in the United States with hundreds of thousands works of art and artifacts. We were overwhelmed by the vastness of the place. In order to get our bearings and to relax a little, we decided that we would first have lunch and then visit the galleries. Robin guided us through the halls to the Bravo restaurant. 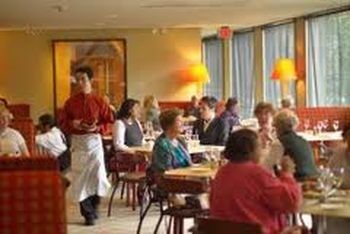 The restaurant is a lovely big space, with clean lines and bold colours that are warm and welcoming. 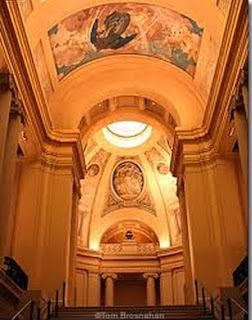 The works of art on the walls are a rotating selection of some of the Museum's modern and contemporary masterpieces. We were learning about the cuisine of our host country and given the pace at which we were eating, were learning fast. 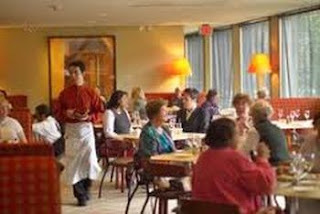 The food at Bravo Restaurant is described as seasonally inspired 'Progressive American Cuisine.' Here, classical French and European techniques are employed using seasonal American ingredients and favouring small farm producers. Whilst the food should always look beautiful, the dining experience would be augmented by elegant surroundings, expert service and superb presentation. The starters were light spring offerings. We decided to share a 'Market Salad'. The description was wonderful: baby field greens, roasted grapes, pignoli, fresh herbs, grilled lemon vinaigrette and a focaccia crouton. As a main course, I chose Jumbo Lump Crab Cakes and Eugene ordered Crispy Skin Atlantic Salmon. The service was friendly, informed and certainly not rushed. There is an award winning wine list, but we decided that we would resist the temptations on offer as we needed to be clear-headed to enjoy the exhibitions. The salad was huge. We crunched the beautifully presented baby greens, grapes and the pine-nuts nestling in the leaves. The salad was delicately flavoured with the lemon vinaigrette and we mopped up the sauce with the focaccia crouton. All delicious. Our fellow diners seemed to be taking their food very seriously and we realised that Bravo is a great deal more than a casual food stop in a gallery. The crab cakes were probably the best I had ever eaten. Light and fluffy with lovely pieces of crab peeping through and a grainy mustard sauce to enhance the piquant flavour. I loved it. Eugene's salmon was excellent. Very fresh, succulent and delicious. It was accompanied by a citrus beurre blanc and an asparagus, orange-fennel salad. It was a superb meal. And now the art! The museum was founded in 1870 and has been at its current location since 1909. 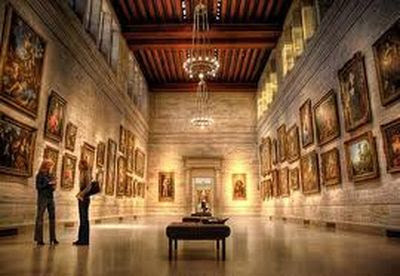 The building is beautiful with high ceilings and wide airy spaces that provide a superb setting for the magnificent works of art. We had to make some choices as to what we would view that day. We could not resist the Impressionists and of course we would see some of the works of the great contemporary American artists. We spent a long while gazing at the extraordinary work of Jackson Pollock. I have always loved his colours and his courage in displaying them in any way he wished. Norman Rockwell's work provided such a visual contrast. Previously, I had seen very little of his work and was fascinated by what we saw that day. A marvellous record of the times he lived through, but I wonder how comfortable people are with some of his representations of American culture in the 20th century. It was very much an eye-opener for this foreign visitor. Then the wonderful treasures in the 'Art of Europe' pavilion. Claude Monet's delicate, soft, almost feminine use of colour, climates and seasons and Vincent Van Gogh's vibrant colours and brushstrokes beckoned. I hope that Van Gogh is sitting amongst the angels and cocking a snook at a world that rejected him and that now pays millions of dollars for his paintings. Combine all that, add Degas' horses and ballet dancers, Gauguin's Tahitian figures and we were sure that we had landed in some Elysian Field where only beauty prevails. It was time to leave. Now on to our second Bostonian adventure and a visit to the John F. Kennedy Presidential Library and Museum. A grand adventure to be sure. So gland your American adventure is a pleasure! Thank you for your very kind comment. Our wonderful American adventure continues. Thank you for the lovely comment. I am so delighted that you enjoyed the piece. A comment from you is a very special treat indeed.